Erin Shields, Giuseppe Spolentini, and David Shenton members of O Sole Trio. Photo courtesy of O Sole Trio. On Tuesday, April 2, O Sole Trio will hit the stage at the Libby Memorial Events Center. The concert will begin at 7 p.m.
Several years ago, three musicians from the far corners of the world moved to New York City with the common goal of pursuing their dreams of becoming world class performing musicians. 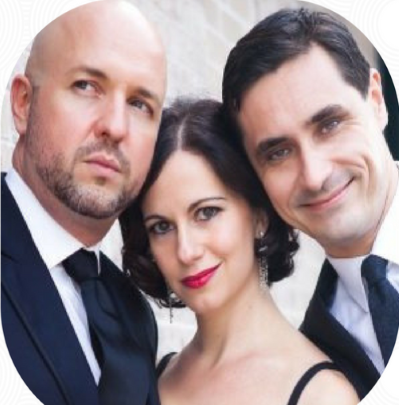 When these three musicians met in New York city in 2012 a musical explosion occurred resulting in the creation of O Sole Trio, an exhilarating and uniquely talented classical crossover ensemble, that has been taking convert halls by storm all over the world. O Sole Trio quickly established themselves as a musical force, selling out major venues such as Carnegie Hall, Lincoln Center for the Performing Arts (who also commissioned their first show), The Redlands Bowl, Calif. (to a crowd of 6,000+), Ronnie Scott’s London, and over 200 other venues all over the United States, Canada and the United Kingdom. O Sole Trio features the lush and mesmerizing voices of soprano Erin Shields, and baritone Giuseppe Spolentini as well as the versatile and virtuosic David Shenton on piano and violin, the world’s first (and possibly only) musician to play violin and piano simultaneously. From deliciously witty to incredibly moving, O Sole Trio shows have it all; they breathe new life into toe-tapping favorites with their unique and innovative arrangements. The trio has garnered rave reviews from audiences and critics alike. O Sole Trio continues to tour extensively throughout the United States. They are extremely proud to provide educational outreach concerts and masterclasses to children of all ages and economic backgrounds. Tickets are $15 at the door and are available for $12 Presale. Students are free with a paying adult.